The REVOLUTION DUO series is built for cases with tunnel design. Air intakes at the back side of the PSU generate extra air stream in the tunnel. 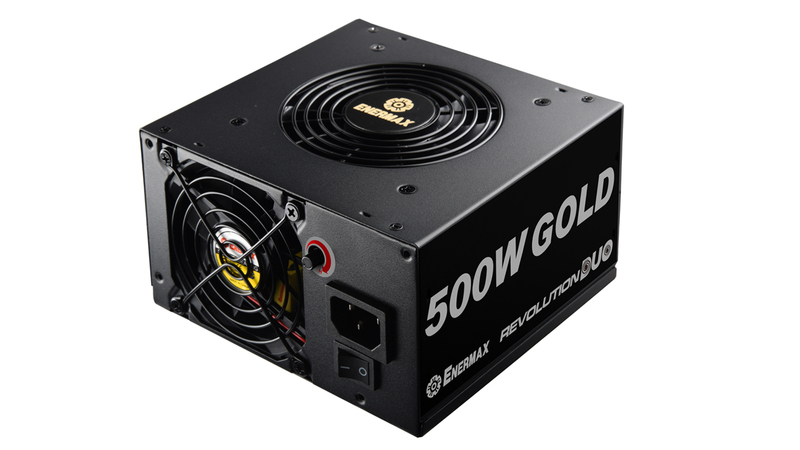 In comparison to single fan PSUs the dual fan design diverts the airflow actively and provides a higher cooling performance. 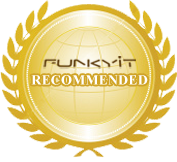 The intelligent fan control optimizes both fans RPM to guarantee a silent operation even at 100% load. 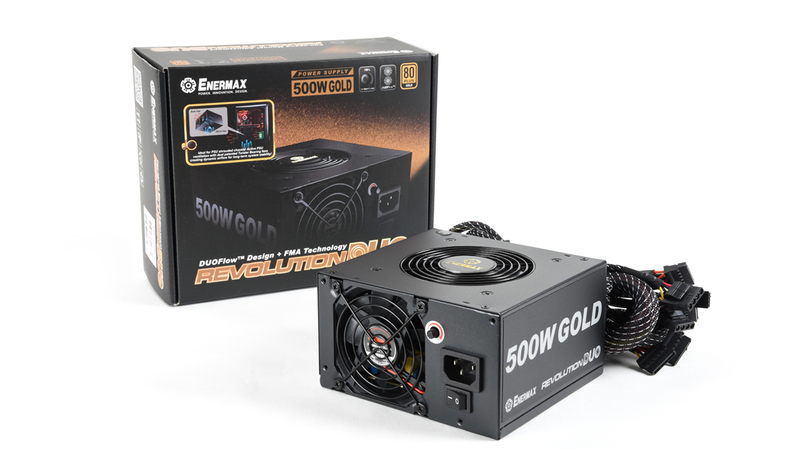 The FMA control allows to manually boost the cooling performance of the PSU and to dissipate heat from system components. Up to 92% efficiency at 230VAC between 20 and 100% load. 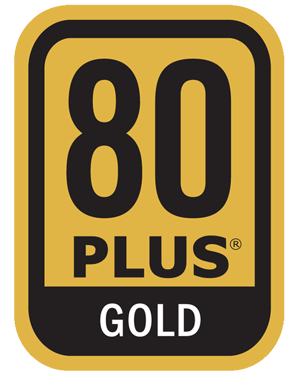 The REVOLUTION Duo series is 80PLUS® Gold certified. REVOLUTION Duo helps systems to meet the EU eco-design directive 2013 ErP Lot 6 and 2014 ErP Lot 3 (< 0.5W in standby mode*) due to a high-efficient 5V standby (+5Vsb) circuitry. Moreover it supports the EU regulation no. 617/2013 demanding amongst others 85% efficiency at 50% load and 82% at 20% and 100% load. The DC-to-DC design generates the secondary voltages (+5V and +3.3V) from the primary voltage rail (+12V). 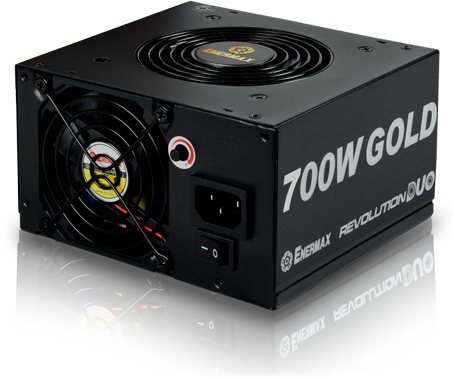 The positive effect is higher efficiency, clean output voltages (low ripple noise) and a perfect voltage regulation at all loads. A massive 12V rail to ensure power for multi-GPU systems (MGPU & SLI™) and overclocked processors. 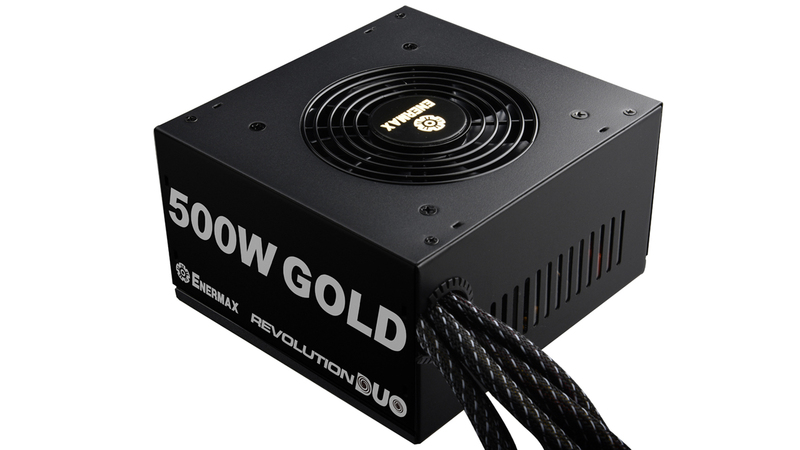 The sleeved cables of the REVOLUTION DUO not only provide an optical highlight, but also protect the cables from damage. A minimum of two 6+2P (8P) PCI-E connectors to power high-end graphics cards. The integrated 10cm (intake) and 8cm (exhaust) Enermax fan with patented Twister Bearing™ technology ensures an efficient and continuously silent cooling and long lifetime with up to 160,000 hours MTBF. The DUO FLow™ Design with two fans diverts the airflow actively and provides a higher cooling performance in comparison to single fan PSUs. 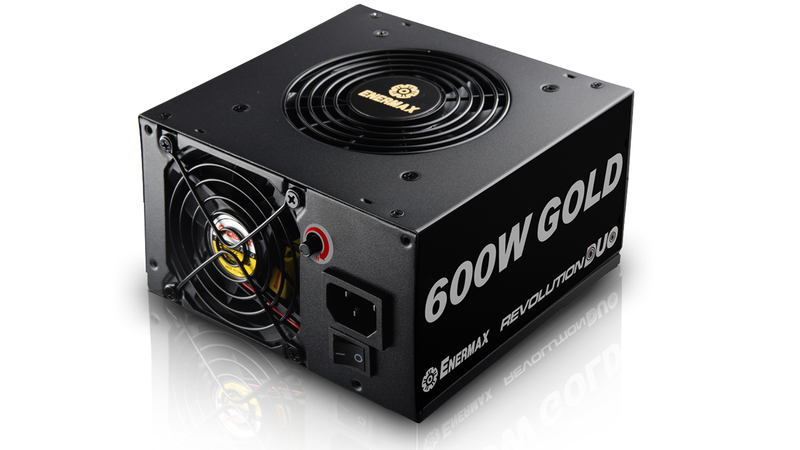 Air intakes at the back side of the PSU generate extra air stream in a tunnel design case. 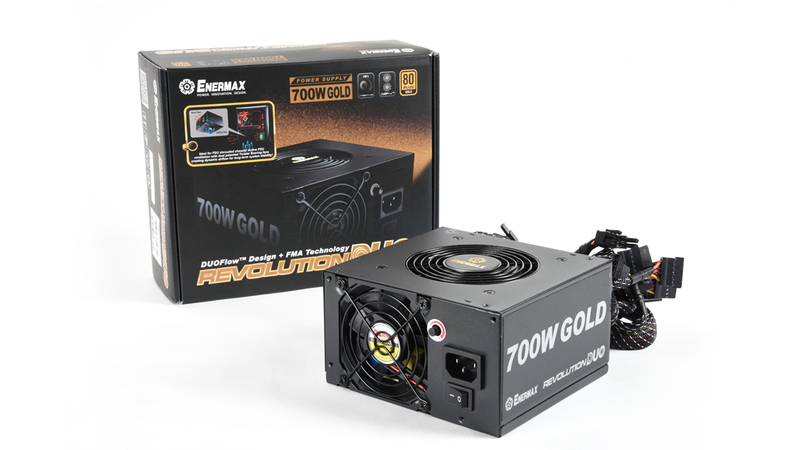 Patented FMA (Fan-speed Manual Adjustment) technology allows users to manually adjust the fan RPM to increase airflow from the fans of the PSU to provide extra cooling for the system when needed. 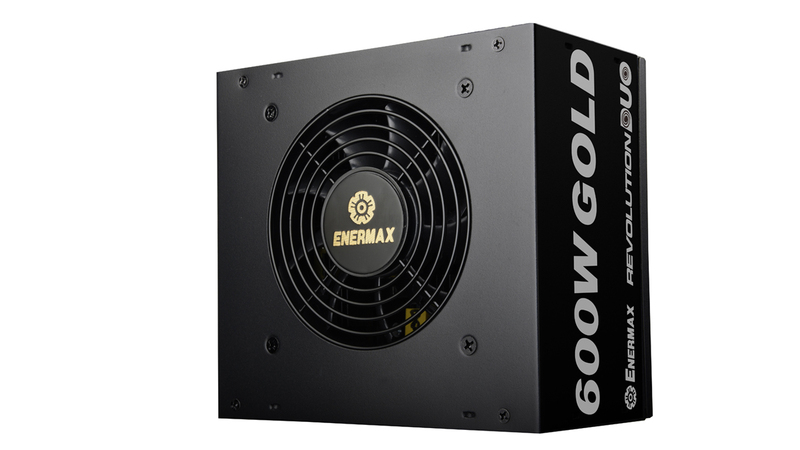 Enermax uses high-quality components including first-class Japanese 105°C electrolytic capacitors for maximum stability and durability. Enermax SafeGuard, the multiple protection circuit that keeps the power supply and the system safe from damage by short circuit (SCP), over voltage (OVP), under voltage (UVP), over current (OCP) (5V/ 3.3V), over power (OPP) as well as surges and inrush current (SIP). Non-Stop 24/7 industrial class performance. Full rated power output at 30°C ambient temperature. *SCP: short circuit protection, OVP: over voltage protection, UVP: under voltage protection, OCP: over current protection, OPP: over power protection, SIP: surges and inrush current protection. *Peak power may last up to 60 seconds. Enermax Europe używa plików cookie. Kontynuując korzystanie z naszej strony internetowej, zgadzasz się na korzystanie z plików cookie. Dowiedz się więcej.